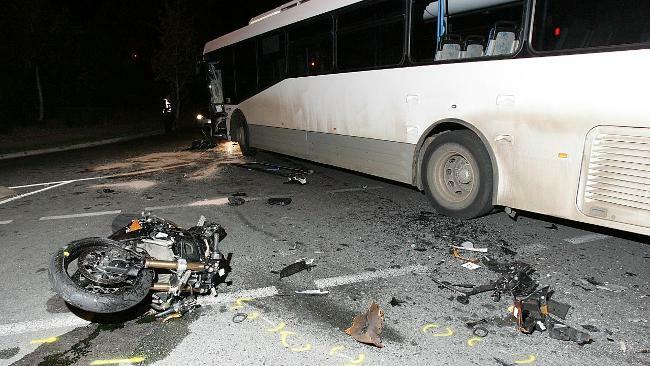 SPEED is thought to have contributed to a fatal motorcycle crash at Forest Lake in Brisbane's south-west last night. A 38-year-old man from Inala was killed when his black Suzuki bike collided with a bus turning from Forest Lake Boulevarde into Grand Avenue about 6pm (AEST). Police said the force of the impact threw the rider into the bus. He died at the scene and his female pillion passenger was taken to the Princess Alexandra Hospital with life-threatening injuries. She remains in a critical condition this morning. The driver of the Westside bus was also taken to hospital suffering from shock. Six passengers on board were unhurt. The Forensic Crash Unit is investigating the cause but police said it appears the motorcyclist may have been speeding. In another serious crash, a motorcyclist suffered multiple fractures after allegedly going through a red light on Kingston Rd at Loganlea and running into the front of a car.